Moon Sugar is a grainy powder of small white crystals refined from cane grasses of Elsweyr's coasts and estuaries. Used as a spice in Elsweyr, it has modest magical properties, and is also a potent narcotic—illegal in Third Era Morrowind and the rest of the Empire. It is commonly refined into a more potent and addictive form known as Skooma. Humans, it seems, are even more susceptible to the effects of moon-sugar than the catmen themselves, and travelers to Elsweyr are thus cautioned against partaking of any of the sugar-loaded native food. Moon sugar has a variety of uses; it is alternately a seasoning and a magical ingredient, a source of communion with the holy moons and a dangerous and addictive drug. It has analgesic and soporific effects; it makes users "happy and stupid." In humans, its consumption causes a euphoric state followed by complete exhaustion. Khajiit are relatively resistant to these effects because they consume it in some form every day, but overconsumption can cause the euphoric state and even addiction. Khajiit take advantage of these properties to tame and train Senche-Tigers, which have a strong sweet tooth that waxes and wanes with the moons. An elixir of moon sugar can be used to "allow the light of the moons into your soul" and embark on spiritual journeys. Much like Senche-Tigers, Khajiit commonly have a strong sweet tooth, and in Elsweyr moon sugar is used as a spice in almost every dish. This makes it almost dangerous for the unwarned guest, as it may cause tooth- and stomach-aches. 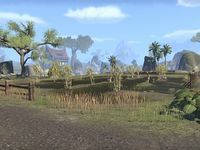 Sugarcane is native to the Tenmar Forest in southern Elsweyr, but production occurs in plantations outside of that region, including the isle of Khenarthi's Roost and Reaper's March, where it requires extensive irrigation with captured rainwater. Symmetrical sugarcane gardens surround the palaces of the Mane in Torval. Criminals have attempted to grow moon sugar grasses in Vvardenfell, without success. Only Halinjirr was successfull growing moon sugar in Zainsipilu on the island. Moon sugar can be grown by combining Jarrin Root (especially dark purple samples), Nirnroot, Nightshade, and lava ash, mixed in equal amounts with water and crushed into pebble sized chunks, and spreading the resulting fertilizer over the moon sugar grass. Moon sugar is illegal throughout the Third Empire but often smuggled. In the Third Era, smuggling of moon sugar was prominent in Morrowind. Dunmer occasionally used Khajiit slaves to transport moon sugar secretly. Some Khajiit have also used the moon sugar trade to their own advantage, growing rich from the drugs run through the main port of Senchal. The moon-sugar of Elsweyr is the holiest of substances to the Khajiit. They speak of sugar as others speak of the soul or the lifeforce. The Khajiit understand it to be "crystallized moonlight," caught in the water of the Topal Sea and brought to the sugarcane groves of the Tenmar by the force of the twin tides. Khajiiti dogma reveres the moons as divine, furnishing life into the bodies of the Cat-Men by ingestion of moon-sugar, a sacred ingredient. Thus, by partaking of the sugar, the Khajiit believe they are consuming small portions of their gods' eternal souls. This drives them into fits of ecstasy and abandon, and the streets of Elsweyr's major cities are full of catmen shivering in the grip of sugar fits.